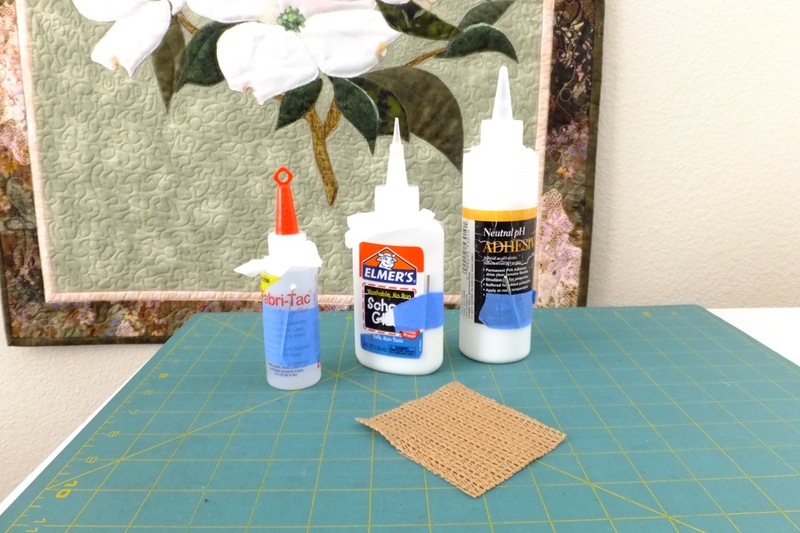 Since I began using this method, I have not had to throw out any glue because it has become dried and unworkable. et’s talk about that sticky stuff. 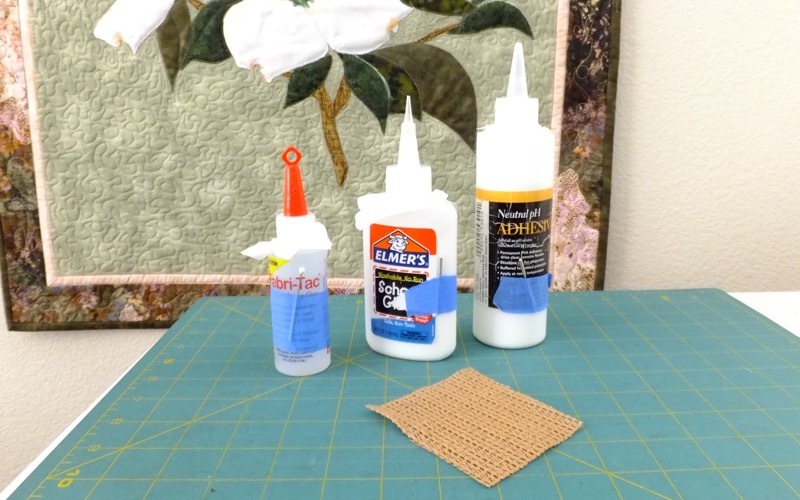 Occasionally, in projects that are to be washed after completion, I will use Elmer’s School Glue. 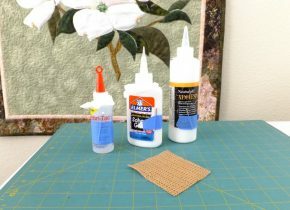 For those that will not be washed, I use an acid free fabric glue. I also use an archival quality adhesive when I am mounting my art to a canvas panel or to a wooden artist’s panel. Now, I will share with you how I keep that sticky stuff fresh and useable even when I don’t use it every day. 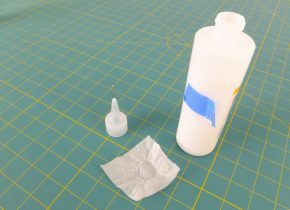 Whenever I use my glue, I absolutely clean the spout under soapy warm running water before I store it until the next use. I use a long pin or a used sewing machine needle to clear the opening while I am rinsing the spout and make sure it is not “glued closed”. I shake the water out of the spout and before I replace it on the bottle, I place a small piece of parchment paper over the bottle opening and then screw the spout on the bottle. And I screw the spout down tight. That is where the small piece of rubberized shelf liner comes in handy – it helps to remove the spout the next time I need to use the glue. The glue stays fresh, the spout will not be glued shut the next time I want to use the glue and the parchment paper will just peel off the top of the bottle. I set the parchment paper aside while I am using the glue and re-use the paper as many times before discarding it. As you can see in the photo, I use blue painters tape to tape the pin to the bottle so I always know where the pin is. I also use the pin to plug the spout for short periods of time during a project but it has not worked well for me for longer storage. It always seems to glue itself to the spout, or depending on the pin, rust can form inside the spout and that is not a “good thing”. 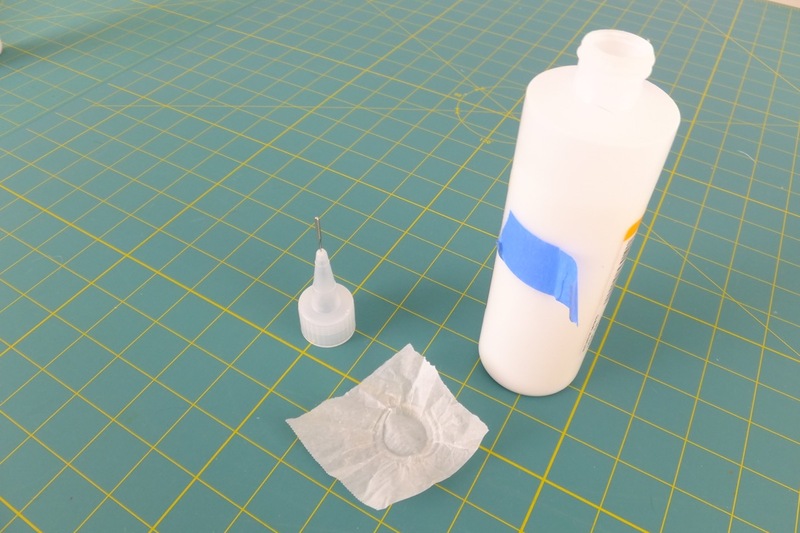 Since I began using this method, I have not had to throw out any glue because it has become dried and unworkable. Next time I will be sharing how I make the small design panels that I find so useful when I am designing my art pieces.